Wild rice is a lovely accompaniment to grilled pike. The Northern pike, or pike, is a culinary catch despite its bad reputation. Pike are notoriously bony, each fillet filled with intricate bones that can be tricky to remove. Deep-frying softens bones, making them edible, and is a good way for a novice to prepare pike. If you or someone you know is adept at filleting pike, this firm-fleshed fish is prime for grilling. Rinse fresh pike fillets under cold running water. Soak the fillets in milk, completely submerging them. Add a tablespoon of salt for every cup of milk used. Soak for at least 2 hours. 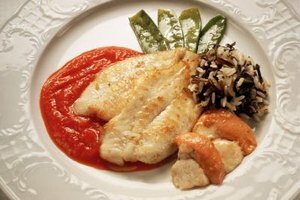 Remove the pike fillets from the milk and pat dry with paper towels. Bring an electric deep fryer or a pot filled with enough oil to cover the pike fillets to 375 degrees Fahrenheit. Add a generous dusting of flour to a plate and add pinches of desired seasonings such as salt and pepper. Combine. Create an egg wash to help the coating stick by whisking together 3 eggs and a cup of milk. Dredge the pike fillets into the egg wash, then through the flour mixture, shaking any excess flour loose. When the oil is hot enough, carefully add the coated pike fillet. Cook until the coating turns golden brown and crispy. Remove the pike fillet and let drain on a rack over paper towels to keep the coating crispy. Repeat this process for the remaining fillets. Serve with wedges of fresh lemon. Preheat your grill to a medium-high heat. Grease the grill grates with olive oil to prevent the fish from sticking. Rinse fresh pike fillets under cold running water and pat dry with paper towels. Massage a drizzle of olive oil into the fillet and sprinkle with desired seasonings such as a subtle lemon-pepper mix or a bolder garlic and Cajun seasoning. Place the pike fillets on the grill. Cook for eight to 10 minutes per inch of thickness, four to five minutes per half inch, carefully flipping once with a thin metal spatula. Remove the pike fillets from the grill and serve with lemon wedges and homemade tartar sauce. Though pike is abundantly fished for sport, you won’t often see it for sale, as the only pike sold commercially in the United States is imported from Canada. You can cut pike fillets into bite-size nuggets for deep-frying. The U.S. Department of Agriculture recommends cooking fish to an internal temperature of 145 degrees Fahrenheit. Insert a meat thermometer into the thickest part of the fish to accurately determine doneness.